hope you had a good start in the year 2010. We had one, but we still miss the good pow. What we do nevertheless, is riding parks, because there is such a good choice, that we couldn’t stop going shred. 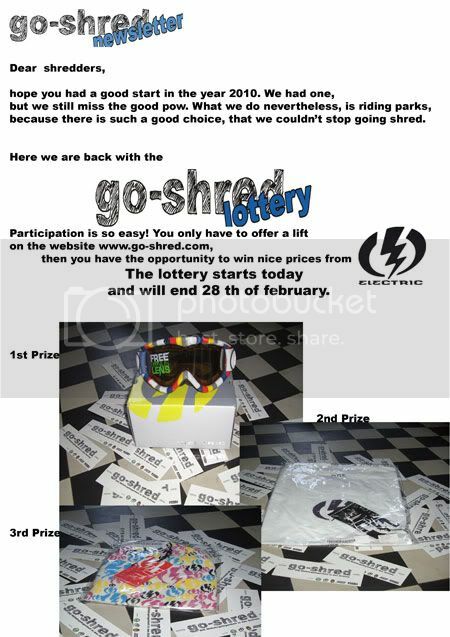 Here we are back with the go-shred lottery. Participation is so easy! You only have to offer a lift on the website www.go-shred.com, then you have the opportunity to win nice prices from Electric. The lottery starts today and will end 28 th of february. So post all your rides and perhaps there is a gift for shredding!! !